This small (30 km.) 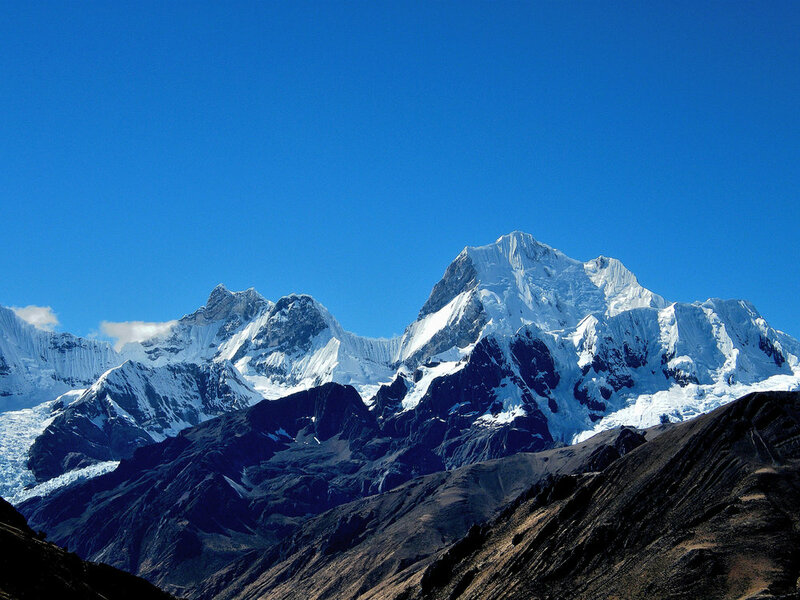 mountain range is probably one of the most spectacular sites in all of Peru. 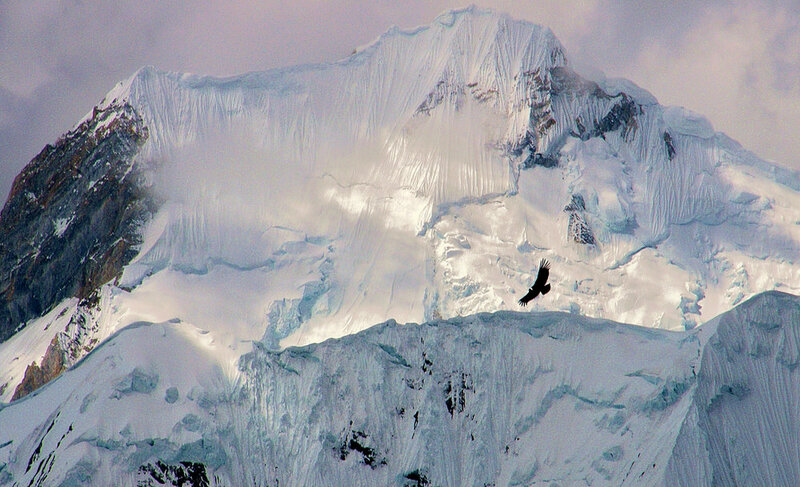 It has six peaks over 6,000 m., and 15 over 5,400 m. - among them the second highest mountain in Peru, Yerupaja (6,634 m.). Sparkling glacier lakes, streams, forests and wildlife are also a feature of this region. 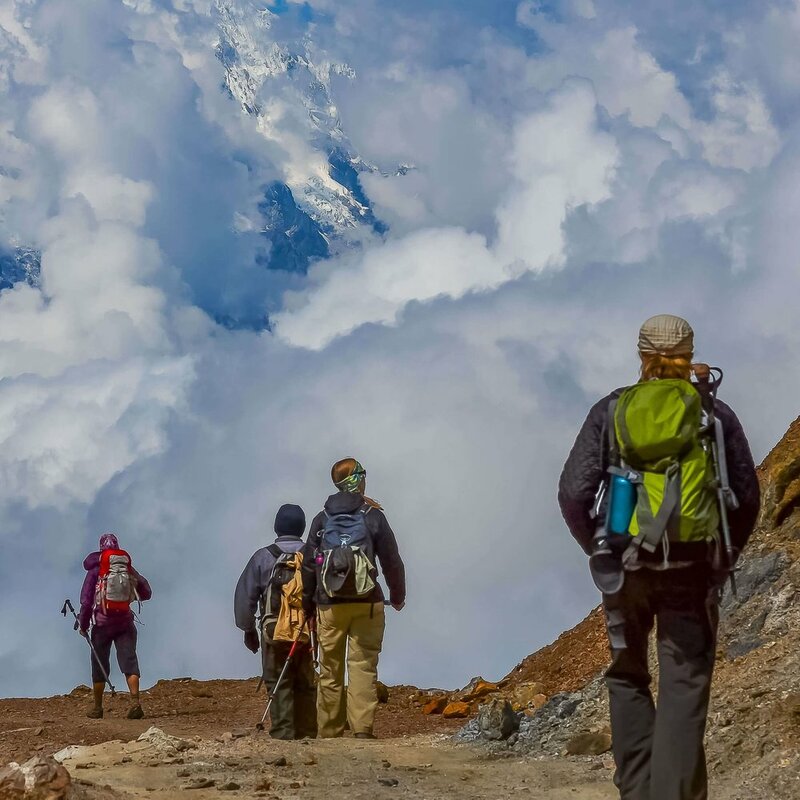 Our trek takes us past the wild summits of Jirishanca, Rondoy and Siula - mountains that are not climbed very often but are on the bucket lists of many of the world's best climbers. We camp close to the beautiful lakes of Jahuacocha and Carhuacocha, where if you are up to it you can fish for your evening trout! We depart from Huaraz at 7AM, and cross the western part of the Cordillera Blanca before reaching the amazing Huayhuash range. Then, we drive by the village of Chiquian and arrive at Llamac aftwe 3 hours on the road. We continue driving to Llamac where we meet our team of mule drivers. We load our bags onto the mules, and start off with our guide for an easy first day of trekking. 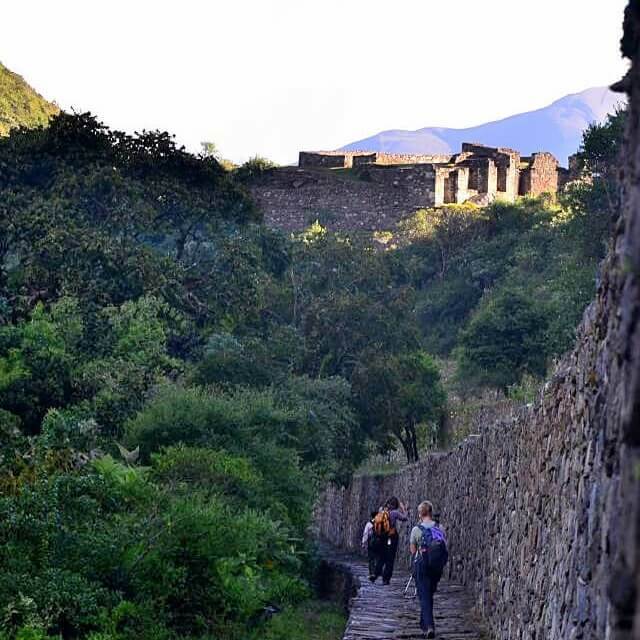 Our hike lasts about 5 to 6 hours in the green and welcoming valley of Llamac. We cross the villages of Pocpa and Pallca by a good footpath without too much uphill along the torrent, and finally reach our evening encampment, Janacota Pampa camp (13530 ft.). After our breakfast at 7 AM, the hike starts by ascending to the pass of Cacanan Punta (15470 ft.). We cross the cordillera and have a spectacular view of the valley that leads to the Amazon basin. We continue to our campsite at Mitucocha. In the evening we camp at the foot of the mountain in the Rondoy canyon. The day starts with a long but easy ascent to the Carhuac pass (15280ft). After the pass, you have a downhill hike through a nice green valley to arrive at one of the best spots of the Huayhuash range. 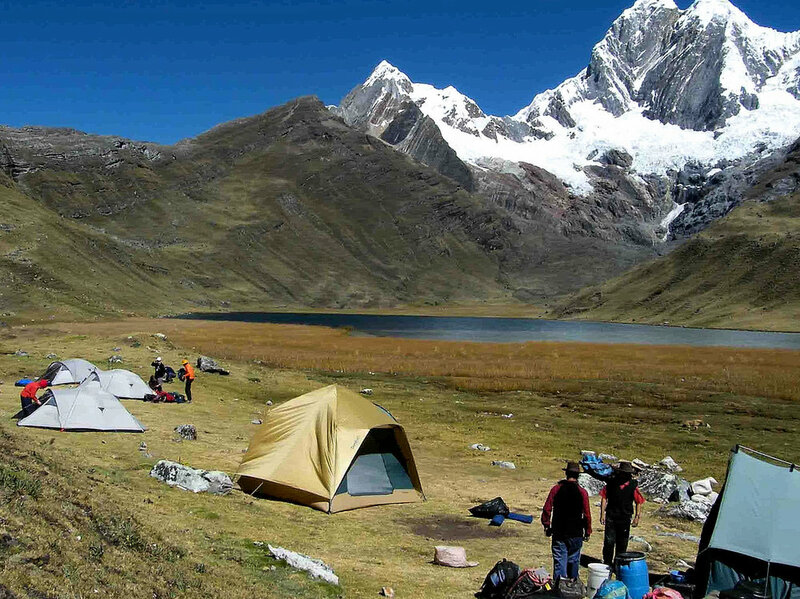 Our campsite is not far from the Carhuacocha lake, and faces the Yerupaja mountain. It is imperative this morning to leave by 7 AM in order to enjoy the hike by the 3 lakes and then the acent to reach the Siula Punta pass (15940ft.). 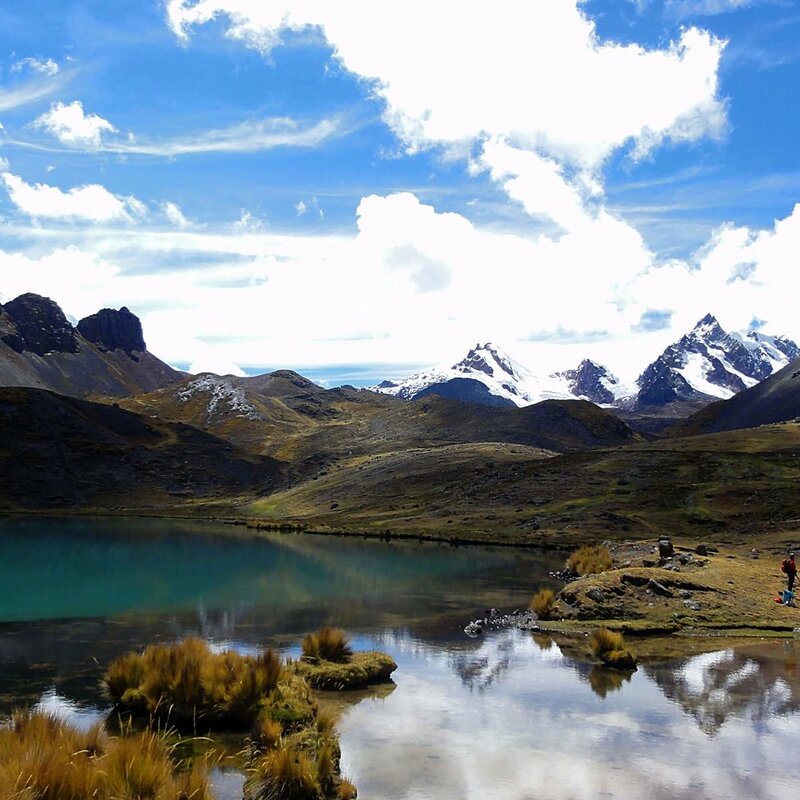 You then continue the hike towards the settlement of Huayhuash, which gives its name to the Cordillera. Today you climb one of the highest passes in the circuit, the Punta Trapecio (5010 m./16530 ft.). 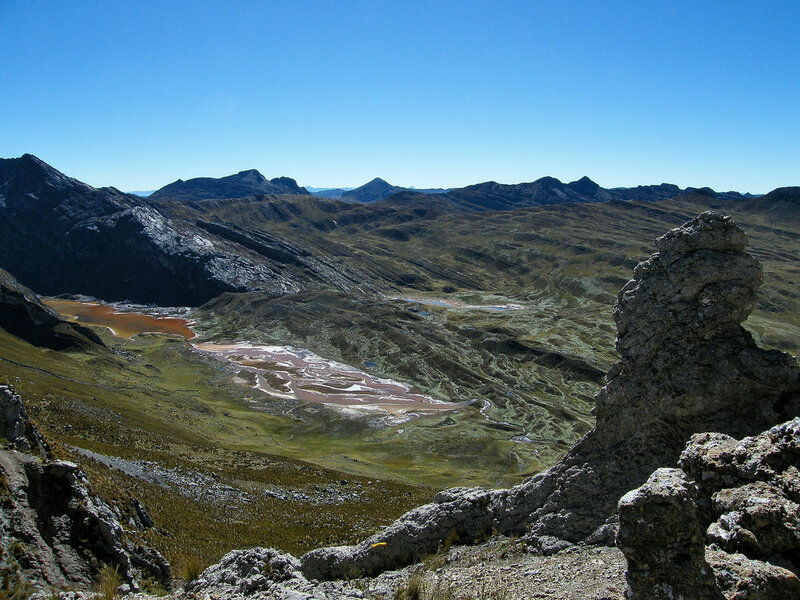 Before reaching the pass, you see to the east the Cordillera Raura. From the pass, you have amazing views of Mt Puscaturpa and Mt Trapecio. Afterwards, the trail follows a very nice and quiet valley, and you hike by a few small lakes with a good chance at spotting “vicuñas” along the way. The campsite is in Yanapampa. Another early morning depart to start the two hour climb to the San Antonio Pass. From this point you have a stunning view of the southwest Cordillera Huayhuash: looking at Mt Sarapo, Mt Siula Grande, Mt Yerupaja, Mt Carnicero, Mt Los Juraos, and Mt Trapecio. You can also appreciate the lakes of Jurao, where you might see some vicuñas. Descend the same valley you have climbed to follow the trail all the way down to Huallapa. From Huallapa it is about 3 to 4 hours walking to the pass of Tapush Punta (4770 m./15650 ft.). This pass offers fabulous views of the Diablo Mudo Mountain and Cordillera Blanca if the day is clear. You continue on an easy path towards the next campsite in Gashapampa. From the campsite it is a couple of hours walking to Yaucha Punta Pass (4820 m./15906 ft.), with stunning views of the Mt Yerupaja. Around this pass it is very possible to spot condors. After some time around here there is a two hour descent to Lake Jahuacocha..
Today we have a day’s rest for those wanting to recover a bit from the strenuous hike. The location is ideal to just sit and enjoy the vistas of Yerupaja and Jirishanka. 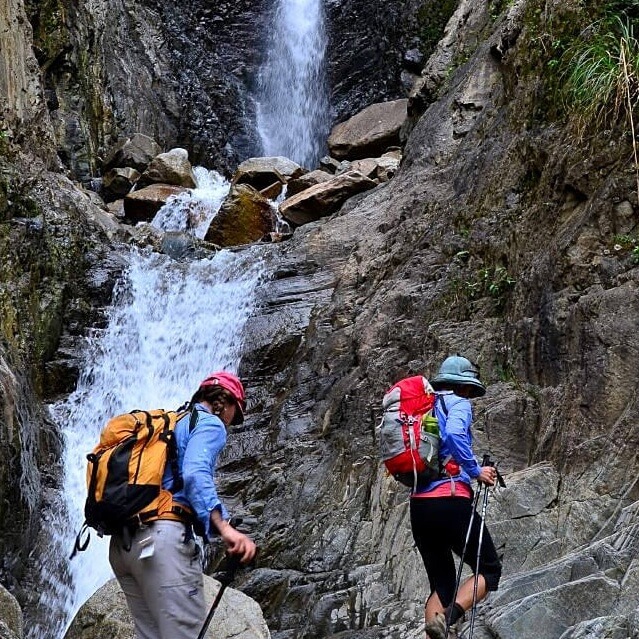 For the more energetic ones, a hike up the valley towards the base camp of Yerupaja is possible. On our last day, we hit the path before 7 AM to reach the pass of Pampallamac (15114 ft.). Then, we descend into the valley of Llamac. We pass by a dry and different ecological area with plenty of cacti and bushes. Once you arrive in Llamac (10725 ft.) you say goodbye to your donkey drivers and catch your private bus to return to Huaraz by late evening. Boiled drinking water is provided after the meals. The meals provided on the Huayhuash Trek are healthy and abundant with 3 courses, and the assistants put up a communal tent to eat in for all meals, including lunch. There are no hot showers along the trail, but every morning and night you arel be provided with a bowl of hot water to wash with.